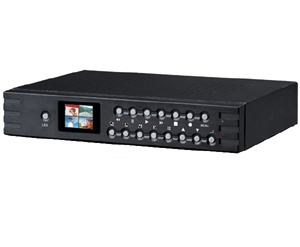 See More DVR's Here This 4 channel Embedded DVR comes with a 160GB hard drive installed and an Integrated LCD screen for instant viewing of your live and recorded camera images. The RTOS user interface is very easy to use and includes functions such as motion detection recording, alarm function, timed searching, forward/reverse searching, adjustable record quality, it also support multiple output formats BNC, S-VCD, VGA and USB for connecting an external display device for monitoring or backup. Supports USB port for connecting PC for monitoring and backup, no need to remove the hard disk. Integrated 1.5-inch TFT, high resolution color screen. Supports motion detection, alarm function. Multi–level signal output(BNC, S-VCD, VGA, USB). Embedded stand alone RTOS design. Real time record, 25 frames / second PAL; 30 frames / seconds NTSC. 1ch, 2ch, 3ch, or 4 channels can be recorded and displayed at the same time. The recorded image quality and display quality can be adjusted. Power failure auto-protect with automatic re-start on power return.